We’ve got a few more hours of experience in waves with the FPB 64 and it is becoming apparent that she will benefit comfort wise from being at the heavy end of her displacement range. This means making fresh water as fuel is burned to keep her heavy if the sea state is uncomfortable. As the previous information we have posted was at half load, we thought this update was due. The data above and what follows was accumulated in flat calm – no wind or waves – with the FPB 64 Avatar carrying full fresh water tanks or 7500 liters/1980 US gallons, 6000 liters/1600 USG of diesel, and about half her personal affects and spares payload. She displaces about 41 metric tons/90,000 pounds in these trials. There is half a knot of current, determined by reverse runs, to be deducted from the speed over ground shown in the photos. 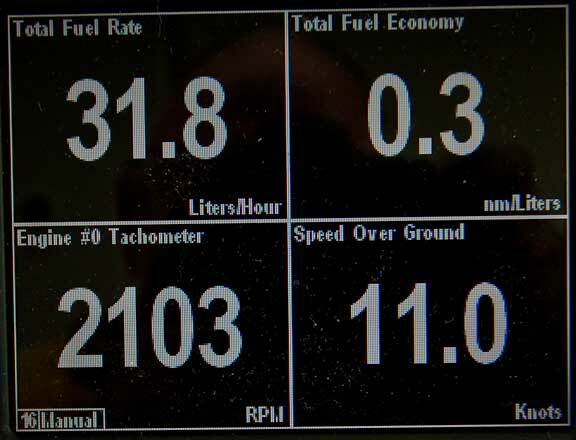 At the end of this blog is a matrix of speed through the water, fuel burn, nautical miles per liter/gallon, speed length ratio, and range with different quantities of fuel. The usual caveats apply. SOG and fuel burn are not damped on the Maretron display and the numbers jump around, so it is a judgment call on the actual values. Average fuel burn would obviously be better if it was based on half load. Also,there is no allowance for electric or hydraulic requirements, nor rough water. In other words, this is a best case scenario and not a real world cruising situation. 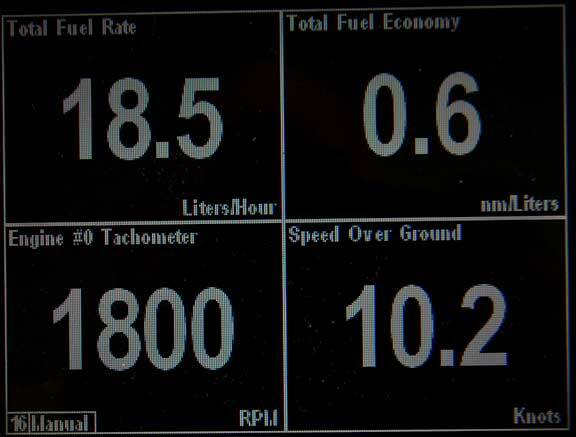 We doubt the boat will be run over 1800 RPM, but have included the next two higher values to crow a bit. The 2366 RPM is wide open throttle, so we are a little over pitched on the prop at present. Speed through the water is 11.0 knots (deducting half a knot current from the GPS derived speed over ground). This is a speed length ratio 0f 1.38. We think that could be considered efficient for a 65 foot/20m 90,000 pound/41 ton yacht with just 236 horsepower at work. While this smooth water, no wind, no auxiliary fuel burn data needs to be degraded for real world additional loads, we are presenting it this way since this is the marine industry norm for how range is calculated. Normally we’d add 2.65 liters/.7 USG of diesel burn per hour for electricity and hydraulic loads, and then another 15% consumption margin for adverse weather. 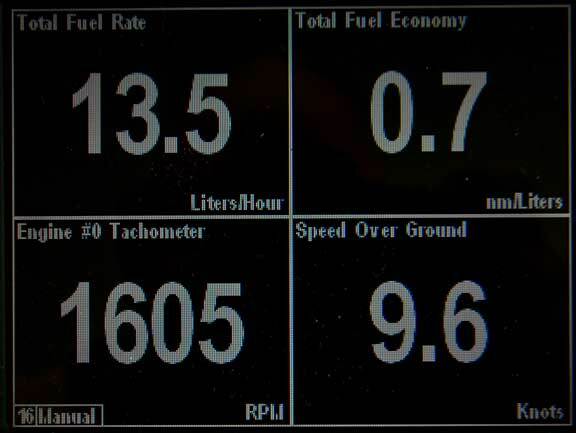 The headings represent (from left to right) Speed Over Ground derived from the GPS, Speed Through Water after deducting half a knot current, liters per hours fuel burn from the Deere CPU readout, nautical miles per liter, US gallons burned per hour, and nautical miles per gallon. 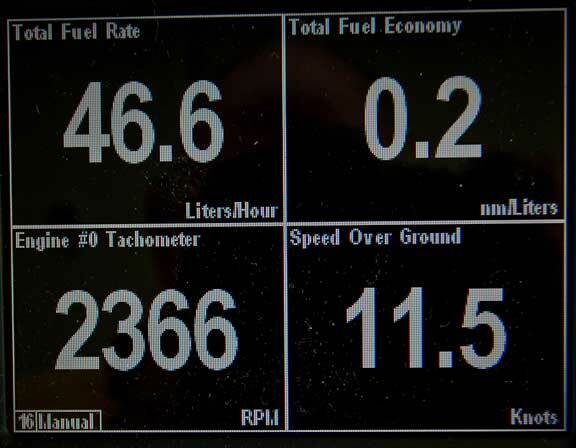 The last three columns are range in nautical miles and have fuel quantity in liters/gallons as headers, and then the range below. A final caveat. This blog was assembled during the 17 hours of travel returning to Arizona from New Zealand, after a very intense two weeks of trials. Normally we’d wait a week to recover and then run the numbers, but we know a lot of our SetSail visitors are impatient for information, so we are publishing it now without a rest period. What we are alluding to is that there could be sleep deprivation errors in the spreadsheet above. This entry was posted on Sunday, April 4th, 2010 at 9:15 pm and is filed under FPB 64 Sea Trials. Both comments and pings are currently closed. Yep, we Net boaters can get a bit impatient for information! Kudos to Steve and Linda for keeping the rest of us up to date, even with all that testing and commissioning going on. And what a wonderful outcome to the project (or so the photos seem to say). Still…. back when the 64 was just drawings, there was a post ( http://dashewoffshore.com/power_range_64.asp ) about the new ship’s expected fuel consumption. And, now that she’s in the water, the preliminary measurements are looking remarkably close to Steve & Linda’s earlier calculations once the difference in displacement is considered. Not orbital-mechanics close, but certainly far more accurate than anything I’ve seen from any car company or most boat builders. Of course, this is hardly surprising, given the design philosophy and the level of expertise involved. It will be interesting to see how these figures look once the 64s have a few thousand miles behind them. Her tanks may be too big for most of us Net boaters to fill, but I suspect this is a boat that will rarely offer her happy owners any surprises at the fuel dock. They’re good figures. I guess even conservatively at somewhere between 9-10kn it’ll still do 6000+NM. Enough to get you from pretty much anywhere to anywhere(within reason). I’m sure most people would be more than happy with that! I used to have a BMW 328, and my mates 325 regularly drank more fuel over a given period/distance, even though it was smaller capacity, because he had to work it harder to achieve the same performance. It got me thinking, would a larger engine working less hard be any more efficient. 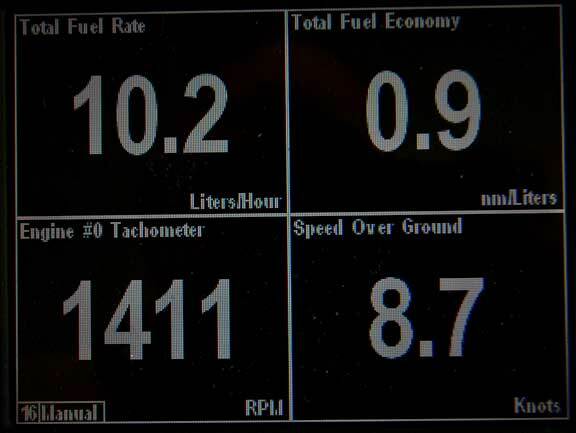 IE: would an engine that could do 10kn at 1200rpm use any less fuel than this one at 1800rpm? Understandably there would be a weight penalty, and would most likely upset the balance you have striven so hard to achieve, right? Just interested on your thoughts. There isn’t a lot in diesel engine efficiency to be gained by the slower turning engine, unless you have room to swing a larger diameter prop. If you do, then the slower turning prop – whether from engine or reduction gear – will show a gain in efficiency. The FPB power requirements are so low that the actual fuel savings beyond where we are at present are not great enough to take the draft hit which comes with the bigger prop. The consumption of Avatar seem to be the same than our “passagemaker” “Hoa”. 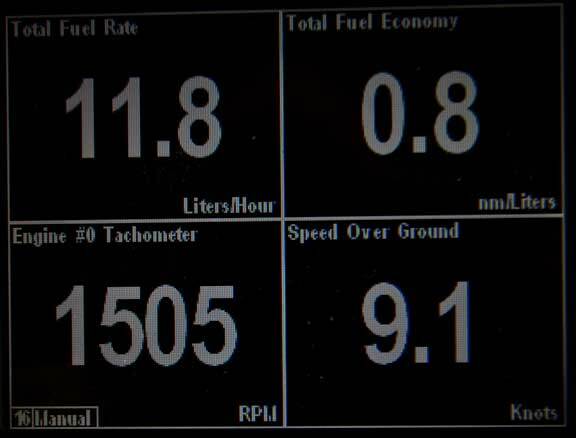 At 9,75 knts on two engines our consumption is 1,78 lt/nm. But our waterline length is just 18,26 m (60 feet) and our weight 32,3 tonnes.